Sewing Pockets - Seven Styles and Sewing Methods - Sew, What's New? I've been doing some reading about sewing pockets because I seem to really mutilate whatever idea I have and end up sewing on those plain old patch pockets. I'm tired of patch pockets and want to try something new. I'm sharing with you, what I have been able to find today in hopes that you are inspired to sew too! The side seam pocket is a fairly easy sew. Add them to any sewing pattern, or, draft your own pattern with the side seam pockets included. Schwin & Schwin provides this free sewing tutorial showing us how she did it. I will admit that the idea of sewing plackets can intimidate me. If you are an advanced sewer and a confident one, give this pocket sewing tutorial a try and let me know how it turned out. You will need fusible webbing! Sewing slip pockets to the lining of your bag sewing projects is a good way to keep important belongings accessible, while keeping them separate from the rest of your custom-sewn garment or bag. See how Shannon sews slip pockets to her handbags! This is a neat sewing tutorial showing us how to sew an accordion-style pocket to the outside of your sewing project, much like a patch pocket. An accordion-style pocket lays fairly flat but opens much wider when it is holding something. I like an expandable pocket especially when we travel! 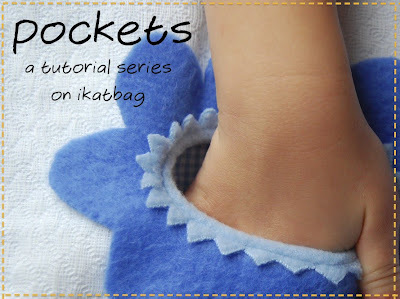 See how Jamie Christina made her accordion-style pockets.with this free printable PDF file. Here is a patch pocket tutorial but this pocket-style offers dimension and texture to your sewing project by adding pleats and a band sewn along the top. I like this idea and style. Check out this blog to learn how to sew this patch pocket yourself! You can do it! Also see: The Simple Solution to Perfect Pleats - Sewing Tip and How to Sew Box Pleats if you'd like to try adding some pretty pleats. Learn a shortcut to creating box pleat pockets for your next sewing project. This video tutorial can be applied to many sewing projects! Phew! That's all I have time for today but I'm sure there are tons more to explore! "Deftly designed and expertly constructed pockets are essential for every fine garment sewer's repertoire, and with Kenneth as your guide, you'll master these skills. Start by sharpening your design eye with a strategy for auditioning different types of pockets and choosing the style and size that complements your pattern best. Then, Kenneth will help you integrate your pocket design into the body pa.... With Kenneth's guidance, go step-by-step through constructing and finishing seven styles of pockets: regular and pleated patch pockets, shaped and rectangular welt pockets, as well as horizontal, vertical and zippered variations on his foolproof double-welt pocket." AWESOME THANK YOU!!! :D What a great resource! ikatbag has done a series of 25!